ABOVE: The Museo Vetrario, or Glass Museum, is on the Canale San Donato, just around the corner from the Museo waterbus stop. Murano's fascinating Museo Vetrario, a.k.a. the Glass Museum or Museum of Glass, offers a century-by-century tour of Venetian glassmaking. 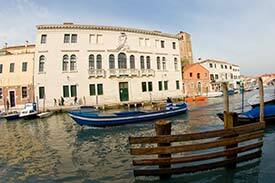 The city-owned museum is located in the Palazzo Giustinian near the island's center. It has samples of glass from Egyptian times through the present day, and the displays show how the art and manufacture of glass developed over the centuries. Reaching the museum: The Museo Vetrario is on the Fondamenta Giustinian, between the Museo Actv (waterbus) stop and the Basilica of Santi Maria e Donato. As you get off the boat at Museo, turn right, follow the fondamenta or canal sidewalk around the corner, and continue a short distance to the museum. For up-to-date information, including ticket prices, see the English-language Museo del Vetro Web site. Barvovier & Toso, a long-established glassmaking dynasty and manufacturer of art glass on Murano, has a private museum with some 250 objects in the Palazzo Contarini on the Fondamenta Vetrai. It also has an archive with more than 22,000 drawings, photos, and other documents related to glass. Free guided tours of the museum are offered from Monday to Friday between 10-12 and 2-5, and it's a good idea to book ahead. See the museum pages of the Barovier & Toso Web site for details and photos of the museum's collection.